Cotton rats are an important animal model to study infectious diseases because of their unique susceptibility towards human pathogens. Whereas mice and rats are often not susceptible to human pathogens, replicate them at low levels or require rodent-adapted pathogen strains, the cotton rat has proven susceptible to a wide variety of human pathogens and to be a model system to simulate a number of important parameters of human disease. In addition to the study of infectious diseases, cotton rats have been used to study toxins in the environment and recently also as a tumor model. A variety of immunological methods have been established for the cotton rat so that immunological responses after infection or vaccination can be evaluated. A large number of chemokine and cytokine genes have been cloned and ELISA and other antibody based systems are commercially available through R&D Systems. In addition, PCR assays have been established. For a number of immunologically relevant cotton rat markers antibodies have been produced or cross-reactive antibodies have been defined which were produced for CD molecules of different species. In addition, a number of sera produced against intracellular molecules like AKT kinase, heat shock protein 72, COX 2 and others react well with the cotton rat counterpart. Cotton rats were inbred by the Veterinary Branch of the National Institutes of Health. Commercial suppliers for this inbred strain are in the USA Harlan Inc., Ace Animals and Virion Systems, and in Europe Charles River. In addition, breeding colonies can be found at various universities worldwide. Cotton rats (Sigmodon hispidus): an animal model for respiratory tract infections with human pathogens. Niewiesk, S. and Prince, G. A. (2002). Diversifying animal models: the use of hispid cotton rats (Sigmodon hispidus in infectious diseases. Laboratory Animals 36: 357-372. Handling the cotton rat for research. Lab Animal 1: 31-36. Niewiesk, S., F. Völp and V. ter Meulen (1997). 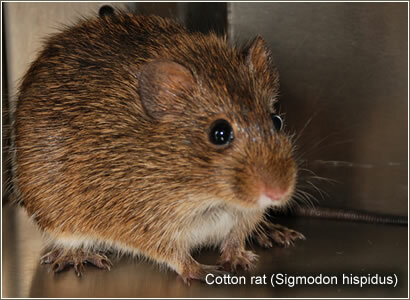 A maintenance and handling device for cotton rat (Sigmodon hispidus).